The main reason I can think of to recommend a few days in Lima, Peru (other than if one’s spouse has a speaking engagement there) is to enjoy the marvelous food ‘revolution’ that has taken over that city. Ask a dozen individuals who either live in Lima or know it well for the name of their favorite restaurant, and I bet you’ll get 12 different recommendations, or at least 10 different ones. We had three outstanding meals and two other good ones over a period of four days. Put these three restaurants on a list for when you find yourself in Lima: Central (beware the Pisco Sours – they’re strong and two will loosen your tongue, etc. ), Astrid & Gaston (try the tasting menu), and Chez Wong (see below). You will be stunned by the presentations and even more by the tastes of what you are served. You can’t go wrong with any of these three expensive but memorable restaurants. One of the three, however, is so unusual and so outstanding that if you are in Lima and do not go there, consider yourself to have made an horrendous mistake. And then the next question arises, “Does it really matter if the film departs from the reality, from the facts? 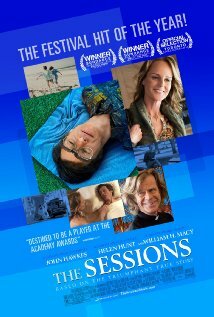 In a film I recently saw and recommend, The Sessions, I again experienced those questions. If you have seen the film, then here is an article written by Mike O’Brien and an interview with him you may find of interest. Together, they add to The Sessions and raise questions about the film. and an awareness of approaching winter. less daylight, and warm cider. unpack winter sweaters and knitted scarves and brace for change. the evening of a journey through paradise passing far too soon. and the game are gifts from a Father’s love. Sleep warm, my dear friend. My wife Ellen and I returned recently from a four night-five day trip to the Peruvian Amazon. We flew from Lima to Iquitos where we were met by a guide from Aqua Expeditions. We then drove to board their 12-cabin, 24 passenger boat where we had wonderful food, air conditioning, hot showers, and stayed in a cabin with windows that allowed us to look out on the rain forest as the boat traversed the river for a total of 450 miles (round trip). During the day we would venture out on small skiffs with one of three wonderful guides, sometimes walking in the rain forest for two or three hours, other times just exploring small tributaries and observing both wild life and human life along the way. Most of our fellow travelers were ‘bird folks,’ and they were delighted with every flapping and every sighting. We mostly just enjoyed being in a very different environment and learning about a world we did not know. One Downside to Our ‘Smart Phones,’ iPads, etc. I enjoy all three of my Apple devices and use them all everyday: my iPhone for texting, for being in touch with my family, and even for the occasional phone call; my iPad for reading, watching baseball, checking email, staying up to date on what’s happening in the world, and for its mobility, and my laptop for working on MillersTime or writing more than 140 characters or short emails. But there’s a price (beyond money) for all this connectedness and ability to be in touch. I’ve always felt there are three ways to enjoy something, three ways to experience an event, an activity, or what we do: looking forward to it, enjoying it while it’s happening, reflecting on it after it’s over. Most people, myself included, seem to be better at the first and third of these than at the second. At least that’s been my working assumption for years. With the added reality of our new technologies, I think there is a further diminishing of our ability to fully engage in something while it’s happening because we also often have our eyes on our ‘smart’ phones, tablets, etc. We are so constantly connected and checking them that I think our attention is diluted from what we are engaged in at any given moment. Pick almost any activity – parents in the park with their kids, people driving, fans watching a sporting event, diners at a restaurant, people walking along the street, folks traveling, etc. – and there’s a good chance some of them/us are also checking our phones for messages, texts, pictures, info, etc. Or what about the intrusion to reading? When I’m reading on my iPad, I find myself at the end of every few chapters, checking my email or a baseball score, or for some other piece of information that takes me away from what I’ve been reading. I’ve noticed over the years that when some new technology captures our attention, whether it’s the TV, tape recording, pagers (remember those? ), desk top computers (remember those? ), music players, cell phones, etc., the tendency is initially to over use them before we learn to control our use. But I sense something different is happening with the smart phones and our ability to be always ‘connected.’ Whether it’s an addiction or not, I’m not sure, but I think they are more than just a distraction. For all the benefits they bring, I think they also interfere significantly with our attention to events and experiences while they’re happening. Am I just getting older and a bit fuddy-duddy, or do others see what I see? So Many Films, So Little Time? I’ve seen two films in the past few days, neither of which I would have gone to if I had read the reviews. The first one (below) I saw because of a recommendation by a friend (ML) who knows film and theater and is a pretty reliable judge of what’s worthy. The second one appeared in our Sunday morning Cinema Club where we don’t know ahead of time what we’re going to see. Both films are good; the second one is excellent. I’m not sure how to review them as neither of them ‘sound’ enticing. I kind of just want to suggest you put them on a ‘to see’ list, after noting the two titles. But I’ll take a shot at saying something about each one for those of you who need to know more. Well I’m not sure they see themselves that way, and the story is a bit convoluted and sometimes not easy to follow but has to do with a guy who is writing a script for a film which he has tentatively titled “Seven Psychopaths,” tho he has no idea of anything beyond the title. I won’t try to tell you what happens, but there are terrific performances by an outstanding cast, particularly Colin Farrell, Woody Harrelson, Christopher Walken, and Sam Rockewell. Michael Pitt, Michael Stuhlberg and Abbie Cornish round out the cast of weirdos in this comedy/drama written and directed by Martin McDonagh. 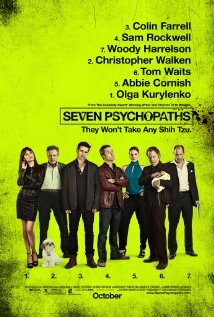 (Seven Psychopaths is in theaters now, at least in DC). We all raised our eyebrows upon reading that and wondered what was wrong with the folks who chose this film. Ninety-Five minutes later we knew the choice was a terrific one, and although the explicit sexual scenes were a bit strong for a Sunday morning, the film was wonderful. John Hawkes as Mark will no doubt be on everyone’s list for awards this year, and Helen Hunt and William Macy are good too. Writer and Director Ben Lewin also deserves to be amongst those nominated for awards. You’re gonna have to take my word on this one. PS-Has anyone see Argo, and if so, is it as good as the ‘hype’ seems to indicate? If you know and enjoyed Janis Joplin in the late 60s, early 70s, then you have just until Nov.4 to see DC’s Arena Stage’s production One Night with Janis Joplin. It’s a good evening at the theater. Actually, it’s largely a concert where Mary Bridget Davies sings many of Joplin’s best known songs, mixed with some of Joplin’s words and views on herself and life. Davies is energetic and recreates what Joplin presented in her very short lifetime. In addition, Sabrina Elayne Carten plays the role of various blues singers and with her wonderful voice adds immeasurably to an understanding of what influenced Joplin as well as provides simply wonderful music. The audience the night we were at Arena Stage (actually in their Kreeger Theater) joined in with Davies and with Carten, and at times it felt as if we were at a live concert (albeit with half the audience being middle age). Randy Johnson, the writer-director, had the cooperation of the Joplin family and access to a great deal of material about Janis. Perhaps it is quarreling a bit, but what he chooses to present and to portray leaves out some of the more difficult and tragic parts of her life, but I guess that would have been a drama and not a concert. 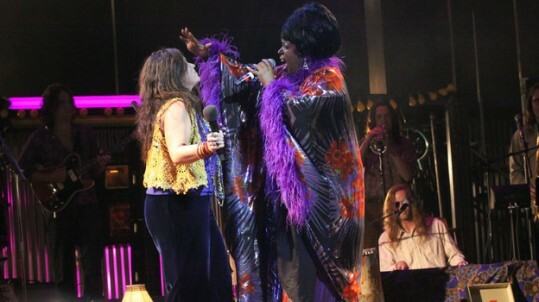 Nonetheless, One Night with Janis Joplin is well worth the effort to see it. 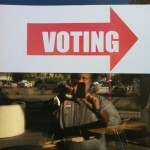 Readers of MillersTime will not be surprised by my vote to re-elect President Obama and Vice President Biden. For me, Romney, at best, represents a future that we have already seen. – one that failed in the last Bush administration. For me, Obama represents a future in which I believe – one that strives for tolerance, fairness, and equality. Both candidates are reasonable men, intelligent and devoted to our country. However, Romney’s move to the right and move away from the more moderate positions he has held most of his life is of significant concern. Obama, while less progressive than I would prefer, has shown a willingness to consider not only his ‘base’ but also what is fair for all. Two long-time friends (from the mid 60s), both teachers and former Peace Corp volunteers, have been involved with a project for a number of years called “Tent of Nations,” (TON). Kay and Bill Plitt have talked with me about Daoud Nasser, his family farm outside of Bethlehem, and the impact their involvement with Daoud and TON has had on their lives. Tent of Nations is the story of the lives and struggles of the Nassar family who live on a farm and peace center just outside of Bethlehem and whose motto is “We Refuse to be Enemies.” The Nasser family bought this 100-acres almost a 100 years ago (1916), then registered it and have been living on it and farming it since the Ottoman Occupation. 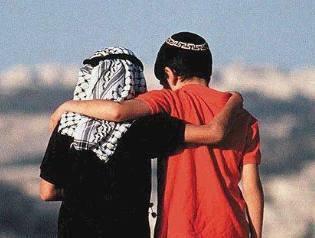 For most of these 100 years, Jews and Arabs lived side by side and were able to get along reasonably well together. With the various outbreaks of war between the Arabs and the Israelis from 1948 on, and with the expansions of Israeli settlements, the Nasser farm has increasingly been the focus of dispute and tension. Daoud Nasser will be in Washington, speaking about his grandfather’s dream, his father’s vision, and his own struggle to find a way of peace in a land filled with conflict. Thursday, Nov. 1, at 7 PM Daoud will speak at The National Cathedral on Wisconsin Ave., NW, Washington, DC in the Perry Auditorium, (take tower elevators to the 7th floor). The DC Cinema Club has not disappointed in its first two offerings this fall. The Oranges – a film about two families who’ve been closest of friends for years – is one of the best written, laugh-out-loud comedies I’ve seen in years. The premise of the film – the prodigal daughter of one family, falls into a ‘relationship” with the father of the other – is a bit unlikely and unseemly, but the hilarity that ensues between spouses and siblings and the realizations by all brings this unpredictable film to a very entertaining and satisfying viewing. In the days of “I can hardly remember the last film that I saw,” this one is memorable. You won’t get it mixed up with anything else you’re going to see this fall. Must see. 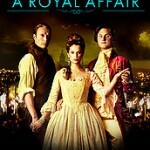 A Royal Affair – the second film offering this fall – was a stunning “period” piece that takes place mostly in the early 1800’s. It tells the true story of Denmark under the reign of the mad king Christian VII. Guided by his personal physician and his Queen, both of whom are entranced by the new ideas of the Enlightenment, the story of political change in a backward country couldn’t be more stunningly told. Overlay that with the intensity of a forbidden affair that ends in banishment and execution, and you have a real winner. Costumes, direction and production are all superb. Another must see. Ed. Notes – Oranges is playing in the DC area at Landmark’s Bethesda Row Cinema, as is Searching for Sugar Man, if you haven’t seen that good one. 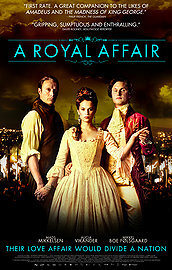 A Royal Affair is coming to the DC area Nov. 9, tho I’m not sure at which theater(s). Also, if you enjoy talking about movies and eating good food, the Millers have room at their table for two more folks to join in on a discussion of some recently seen movies, particularly Queen of Versailles but also Searching for Sugarman, Detropia, The Master, and whatever else you’ve seen in the last few months that is worthy of discussion. We’ll have a Sunday supper and discussion starting at 6 PM at our house in DC on Nov. 11. Let me know if you’re interested in joining us (Samesty84@gmail.com). Eleven predictions came true (either exactly or close enough to be declared finalists) for Contest #1: Make a Prediction about the 2012 Baseball Season. *Deadline to send in your selection is Oct. 31 at midnight. *You can send your choice to me by email (Samesty84@gmail.com) or simply put it in the Comment section below. 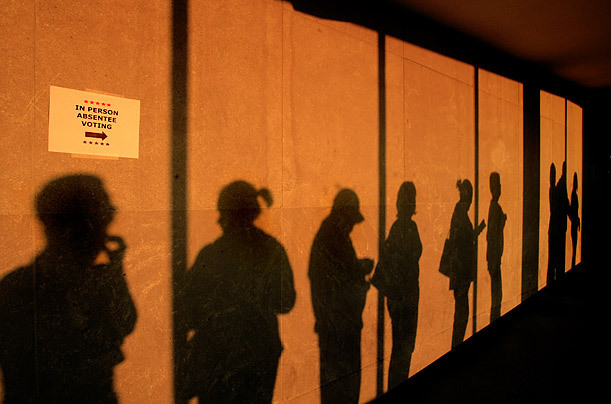 *Consider adding an explanatory sentence or two when you vote, especially if you want others to be influenced by your wisdom, insight, or because you want them to vote with you. 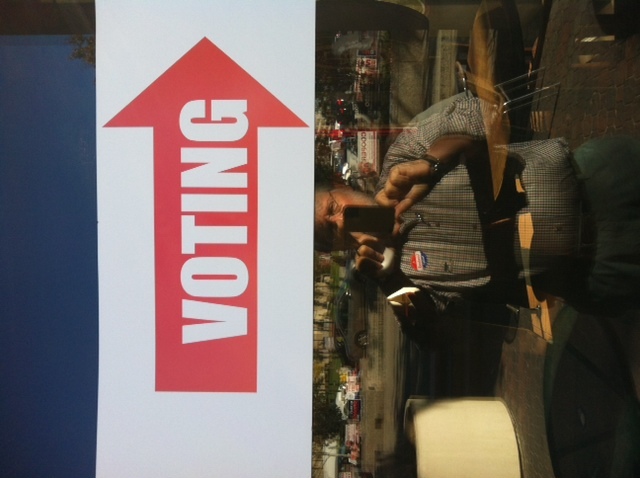 (If you send your vote by email, let me know if I can post it in the Comment section). *You have to be on the MillersTime email list or you must have made a submission to at least one of the MillersTime Baseball Contests over the past three years. Here are this years finalists. Vote for the one you think is the Best Prediction, however you want to define “Best.” Remember, all of these predictions were made before Opening Day 2012. Papelbon stellar Year. Sox will miss him. Bravo to The Studio Theater for bringing this production to DC. About 50 years ago, Ralph Ellison’s Invisible Man was part of my awakening to the realities of racism in this country. In 1963, not long after reading it, I went to East Africa for a summer, and my understanding about racism was further enhanced by working with a multiracial group of American and Tanganyikan teenagers — all this in the larger context of East Africa. On returning to the US, the civil right movement was in full bloom: the March on Washington occurred the day I arrived back in the US. But it was Ellison’s book with its powerful opening sentence, “I am an invisible man,” that truly began my awareness of what I had not seen nor understood when I grew up in Florida — a state as much a part of the South as Mississippi or Alabama. I have since forgotten most of the details of Ellison’s book, but thanks to the invitation of a friend, we just saw a stage presentation of it at DC’s Studio Theater. In Oren Jacoby’s adaptation of the book, every word of this production is Ellison’s as his ‘Invisible Man’ takes the audience on his journey from being a young man in the south to and through his true eduction in the north, largely in Harlem. 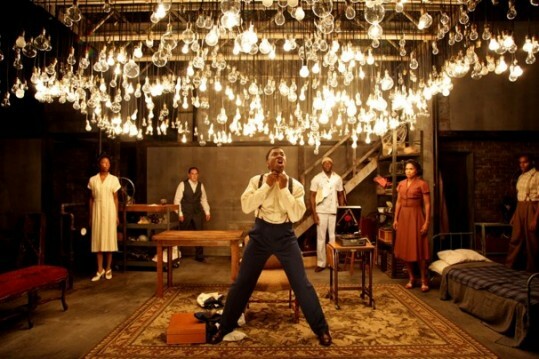 Not as powerful for me as the book, nonetheless this staging of Invisible Man is another way to understand what it is to be invisible and to understand what it is like to grow up being black in America. Presented in a multi-media format, the ten actors and actresses (most playing more than one role) bring the book to life. 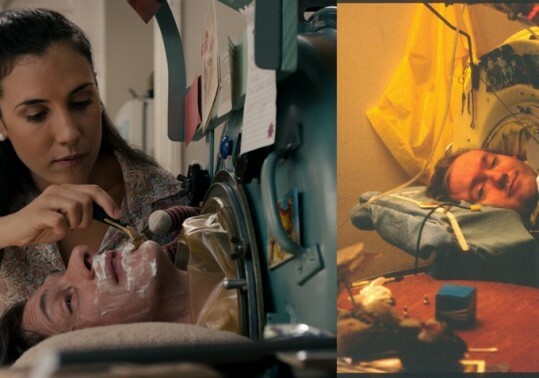 Some scenes are very powerful; some are good; and some fall flat and seem unnecessary. The first two acts are better than the third (which could use a bit of pruning), but even though this production is three hours long (with two intermissions) and is heavy on the dialogue and monologue, the audience seems to stay with it through the evening. That is in part because of the creative staging and the good use of music, lightening, set design, and video. It is also because the story is so nuanced, so layered, that each incident reveals another aspect about the black struggle to be visible. Some of the acting is simply terrific. Teagle F. Bourgere, as the ‘Invisible Man,’ has the most demanding role as he’s on stage for the entire three hours. Whether it is because of how the role was constructed or because of his acting, I found myself wishing for a more powerful performance from him. Not so, tho, from the strong supporting cast. They are terrific. Try to see it if you can. It’s a production you will remember. Studio Theatre’s Invisible Man will be here for just another couple of weeks, ending with an afternoon performance on Oct.21. For tickets, check out the theatre’s website. In Contest # 1 – About one-third of the specific predictions folks made actually came true. In Contest #2 – Most predicted the Nats would do better, but the closest anyone got to their 97-65 record was 93-69. In Contest #3 – No one got close to getting all six of the Division leaders at the All Star break. The best anyone could do was only three out of the six. In Contest #4 – Most thought the Yanks (94-68) would do better than the Sox (69-93), which they did, but no one foresaw the huge slide for the Sox (nor the Phillies, 81-81, for that matter). In Contest #5 – A majority of you thought the Yanks would beat the Sox in the 12 games they played after the All-Star break, but only two of you called it exactly (8-4). In Contest # 6 – Most predicted the Angels and Phillies would be in the WS. Not happening. Not even close. Now for the specifics and the winners for the contests that are final. Generally I post about small, independent movies, often ones that are not always easy to find but are usually worth the effort. Today I post mini-reviews of two films that are easily found. 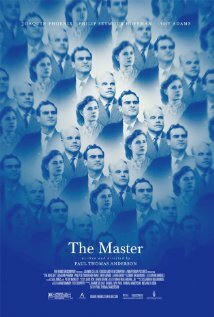 The main reason to see this film is for the performances of Joaquin Phoenix and Philip Seymour Hoffman. Tho the title of the movie refers to Hoffman’s role as the charismatic leader of what is really a cult, it’s Phoenix’s portrayal of a lost soul, a drifter, the alienated alcoholic Freddy that makes The Master worth seeing. The film follows Hoffman, Lancaster Dodd, as he tries to convert and give meaning to Freddy’s life and at the same time make sense of his own journey to lead the movement known as “The Cause.” Amy Adams, as his wife Peggy, also gives a strong performance as she seeks to support Dodd and convert Freddy. For some reason The Master is not an easy movie to “get,” to know what the story and performances want you to learn or to take from it. Some say it’s an indictment of Scientology and it’s founder L. Ron Hubbard, but I didn’t know that until I read about the film after seeing it. I suspect it’s about more than that. I just don’t know exactly what that ‘more’ is. If you like baseball and don’t mind a somewhat predictable, mawkish story, then I think you’ll enjoy Clint Eastwood and Amy Adams in this film. It’s a father-daughter story that held me throughout, even tho I could see what was coming, for the most part. Eastwood gives a solid performance as a crabby, aging scout (Gus Lobel) for the Atlanta Braves, and Adams, as his stubborn, ambitious, hurt daughter (Mickey), keeps up with Eastwood. 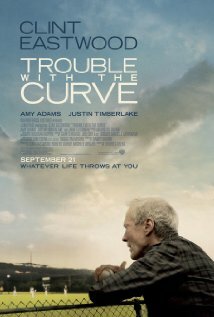 Trouble With the Curve has some similarities to Moneyball, but it departs from that good film as we get involved with the lives and struggles of Gus and Mickey. Maybe this movie doesn’t have the subtleties and artfulness of many of the independent films I usually enjoy, but I liked it.